This pizza is delicious and really simple to make. However, unlike the traditional variety, polenta pizza is not a grab-and-go meal; it is softer, so you’ll want to eat it with a fork. You can either make mini pizza crusts that guests can top themselves or make the pizza in a 10-inch square pan and cut it into 2-inch squares as a fantastic hot appetizer for a get-together. Heat oil in medium-large saucepan over medium heat. Sauté the garlic until it starts to become translucent (do not overcook). Add the water, salt and rosemary, and bring to a boil over high heat. Reduce the temperature to low and whisk in the cornmeal, adding it very gradually. Keep whisking continuously until the polenta becomes very thick; cook for about 1 more minute, until it begins to move away from the bottom and sides of the pan. Pour polenta onto a parchment-covered baking sheet or in a silicone pan form and very quickly spread it to make a 12-inch diameter round, about ¼-inch thick, moving rapidly before the polenta has a chance to set. For mini-pizzas, make several smaller rounds. Allow the polenta to set fully, 5 to 10 minutes. Brush the top surface with avocado oil and bake the crust for 15 minutes. Remove and let cool before adding the sauce and toppings of your choice. After topping, return to the oven for about 20 minutes or until the toppings are heated and the cheese has melted. Serve immediately. Nutrition Analysis (without toppings): 100 cal, 2 g fat, 0 mg chol, 390 mg sodium, 21 g carbs, 2 g fiber, 0 g sugar, 2 g protein. 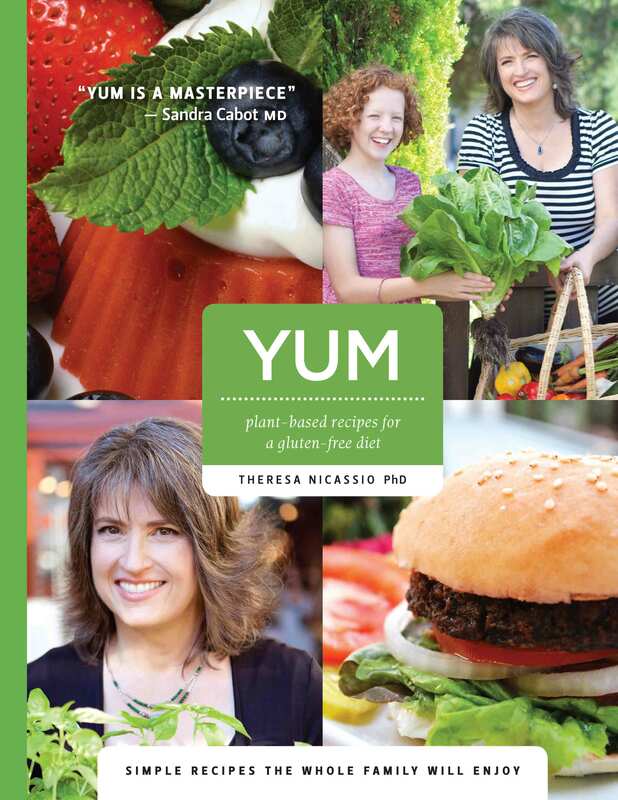 Recipe by Theresa Nicassio, Ph.D. Reprinted with permission from YUM: Plant-Based Recipes for a Gluten-Free Diet. Certified as a gourmet raw food chef and nutrition educator, Nicassio is a registered psychologist and bestselling author. She creates plant-based, heart-healthy, anti-cancer and diabetic-friendly recipes that are all free of gluten, sugar, dairy, eggs and potatoes. Learn more at yumfoodforliving.com.